Shortage of irrigation water in Pakistan is an inevitable truth. The shortfall of water is increasing very rapidly with the passage of time. Among the 25 most populous countries in 2009 South Africa, Egypt and Pakistan are the most water limited nations. According to the United Nations World Water Development Report the total actual renewable water resources in Pakistan decreased from 2961 cubic meters per capita in 2000 to 1420 cubic meters in 2005. If the current trends continue it could go as low as 550 cubic meters by 2025. There is severe water shortage looming in Pakistan. According to a 2006 World Bank report it is fast moving from being a water stressed country to a water scarce country. Our per acre production of different crops is less than many developing countries of the world. 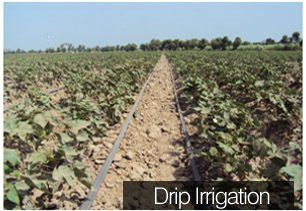 Drip irrigation trend of row crops is increasing throughout the world. 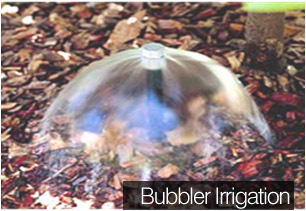 This irrigation method has the advantage of precisely applying irrigation water in the root zone, thus offering the potential of increased profit due to reduced water, fertilizer, cultural costs and increased revenue due to increased yield. 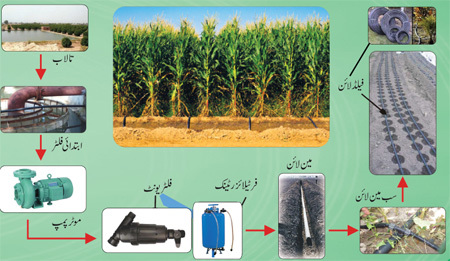 Four Brothers High Efficiency Irrigation System is a revolutionary approach in Pakistan. Our theme is Productivity Enhancement through the System. The cost of per acre yield is increasing day by day with the increase in input cost. It is not wise to suggest the farmer to increase yield at the increasing cost of inputs. > Increasing per acre yield. > Decreasing input per acre. > Increasing efficiency of inputs. > Saving of power, electricity/diesel. > Cultivating more land/acres with less water. 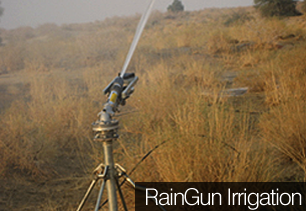 > Irrigating maximum land with minimum number of hours. > Uniformity of yield per plant per acre. The concept demands us more expertise to be developed in local agriculture. For this we are collaborating with some agricultural universities & agriculture research stations. We are satisfying customer with full range of micro nutrients (sole manufacturer of micro nutrients in Pakistan) compatible with drip irrigation, macro fertilizers like DAP and Urea, high yielding seeds, noble pesticide chemistries and a very dedicated field support team. Sales & marketing department comprises of experienced Agriculture Graduates, who assists the farmer in field survey & documentation for after sales services. 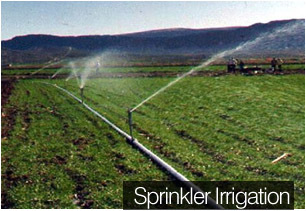 Where Agriculture Engineers guide the farmers regarding maintenance of the irrigation system Agronomists and Horticulturists at our panel guide the farmers regarding all aspects of crop production related to drip irrigation system. A team of experienced Design Engineers develop designs of high efficiency irrigation system projects according to the required specifications using latest computer software. Experienced Agriculture Engineers lead the installation with the team of skilled & experienced supervisors & technicians. The Four Brothers HEIS (High Efficiency Irrigation Systems) Pakistan launched in May 2009, is the newest addition in the Four Brothers Agro Division. Since inception, Four Brother HEIS Pakistan has brought a revolutionary approach in the agriculture of Pakistan with its theme to Productivity Enhancement through High Efficiency Irrigation Systems. Four Brothers HEIS Pakistan is involved in Sales and Marketing, Designing and Installation of the following types of Irrigation Systems.